Hi darlings! Today I’ll show you how to make homemade chocolate bark, that’s a perfect sweet treat for Valentine’s Day. 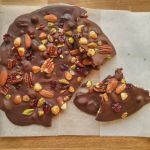 This homemade chocolate bark recipe is vegan, super quick and easy to make. 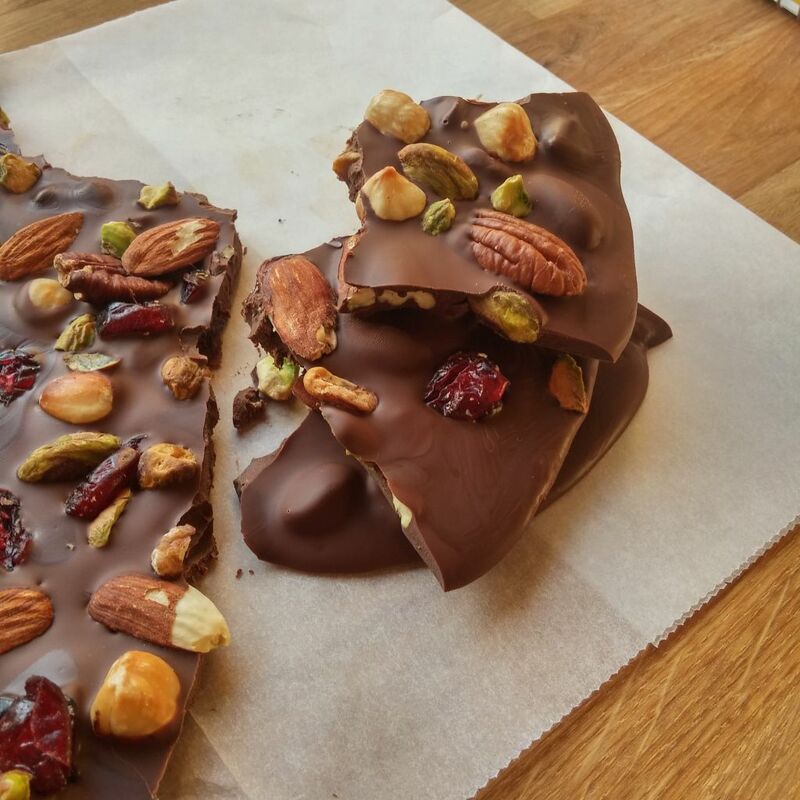 In under 20 minutes, I’ll show you how to make chocolate bark from scratch. 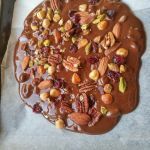 All you need is some dark vegan chocolate, and a variety of different nuts. because I love the combination of their shape, color, and size. But you can use any nuts you wish, as long as you follow the total amounts below. Start by heating up the oven to 356 degrees F (180 C) and arranging your nuts on a baking tray lined with baking paper. Once the oven is nice and hot, pop them in for about 5 minutes. When they start to slightly change color, take them out to completely cool. Heat up a small pot with about 1 inch of water (2.5 cm). Place the chocolate in a heat proof, glass bowl, that will perfectly sit on top of your pot. As soon as the water comes to a boil, switch off the heat, and place the bowl on top of your pot. Make sure the bowl doesn’t touch the water. The steam is just enough to gently melt our chocolate. Wait a minute or two, then start to stir. When you’ve melted half of the chocolate, carefully take the bowl off the pot, with oven mitts, and continue stirring until all your chocolate melts. In a separate bowl, mix the nuts with the cranberries. Then, mix half of your nutty mixture in with your chocolate. 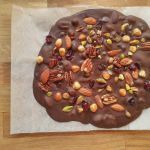 Finally, pour the chocolate onto a tray lined with baking paper, decorate with the remaining nuts, and place in the fridge. After 20 minutes, take them out of the fridge, snap into desired size, and dig in! Now, if your tempered chocolate didn’t succeed, that’s fine. It’s not the end of the world! Simply keep them in the fridge until ready to devour! Have you tried my Scrumptious No Bake Energy Bites yet? They only have 4 ingredients, and are very flavorsome! ← Vegan Chickpea Burger Recipe – Gluten Free!